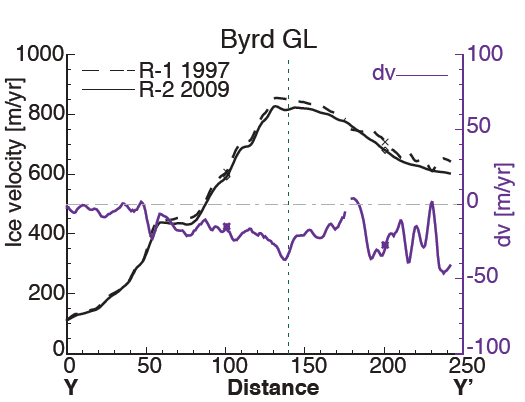 New paper using RADARSAT data: Antarctic ice shelves slowed down – "…have not been changed in a significant way in the past 12 years" | Watts Up With That? West Antarctic ice shelf – a nudge and a push from collapse? Clearly, there’s lots of gloom and doom surrounding Antarctic ice shelves for the worry that they’ll cause catastrophic sea level rise if they cut loose. Overall, however, the observed changes have little impact on the mass balance of the region. We therefore conclude that in contrast with their counterparts in the Amundsen and Bellingshausen Seas (Rignot et al., 2008) the ice streams and ice shelves in the broad region under investigation herein have not been changed in a significant way in the past 12 yr, which suggests that the ice dynamics of the entire region does not have a strong impact on the mass budget of the Antarctic continent. That’s quite a statement compared to the news headlines. To paraphrase NSIDC’s Dr. Mark Serreze famous “The Arctic is screaming” quote, I suggest that from the perspective of the data presented in this paper, I’ll say “The Antarctic is snoring”. Fig. 2. Ice surface velocity maps for Central Antarctica for 1997 (a) and 2009 (b) overlaid on MOA. (c) shows the velocity difference dv (2009–1997) for the entire region. Superimposed on (c) are velocity contour lines taken from the IPY ice velocity map (Rignot et al., 2011b). Blue tones indicate a slow down. 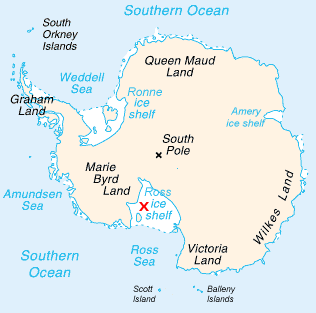 The two dark red regions on the ice shelf edges (Ross Ice Shelf near Roosevelt Island and Filchner Ice Shelf) indicate pre-calving events. 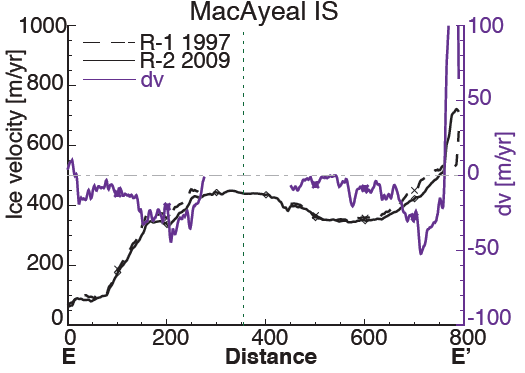 map of ice velocity changes with a nominal precision of detection of ±3–4myr−1. grounding lines of 30myr−1 (6.7 %) and 35myr−1 (4.1 %), respectively. 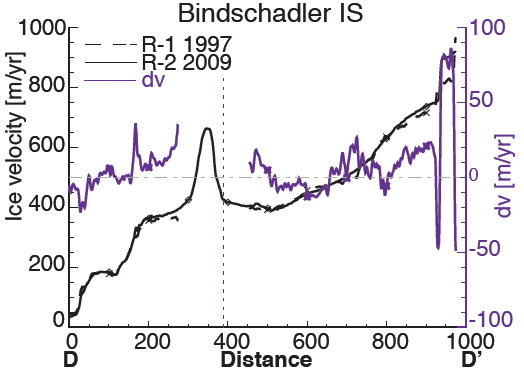 Bindschadler Ice Stream is faster by 20myr−1 (5 %). Most of these changes in glacier speed extend on the Ross Ice Shelf along the ice streams’ flow lines. At the mouth of the Filchner/Ronne Ice Shelves, the 12 yr difference in glacier speed is below the 8% level. dynamics that have almost no impact on the overall ice balance of the region. motion patterns (i.e. Bindschadler et al., 2003), field measurements continue to be vital in glaciology (e.g. Aðalgeirsd ´ ottir et al., 2008). Secondly, spaceborne remote sensing satellites are a means to measure ice velocity without the necessity of ground campaigns. They allow data collection over vast areas, thereby providing information that would be practically impossible to collect in the field. Since the launch of the European ERS satellites in the early 1990’s, spaceborne Interferometric Synthetic Aperture Radar (InSAR) data have become the single most important means of measuring ice velocity. Projects and area coverage have evolved from single glaciers, over ice fields to most recently covering the vast ice sheets of Greenland and Antarctica (Rignot et al., 2011b; Joughin et al., 2011). InSAR satellite data coverage in Central Antarctica remains sparse. The first complete interferometric mapping campaign covering South Pole took place in 2009 as part of a coordinated acquisition campaign for the International Polar Year (IPY) (Jezek and Drinkwater, 2008). the ongoing evolution of glaciers and ice shelves in these regions. 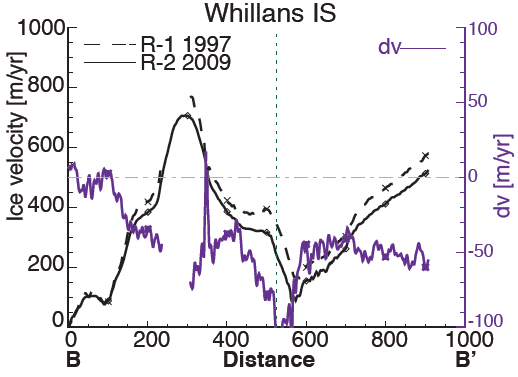 of changes in speed with a precision of about ±3–4myr−1. Our change map provides new, important information about the evolution of this sector of Antarctica, or lack thereof. Filchner and Ross Ice Shelves exhibit signs of pre-calving events. Other than those, the Filchner/Ronne sector shows few changes, with most ice streams slowing down slightly. The 12 yr velocity difference for all glaciers and ice streams in the region is below 8 %, which is of little consequence for the overall mass budget of the region. The most distinct signal, however, is a slight slow down of the Filchner Ice Shelf, consistent with an ice shelf advance, and a small slow down of Slessor Glacier over a large sector that warrants further study. On the Ross Ice Shelf, we confirm the slow down of Mercer and Whillans Ice Stream, with a 12 yr velocity difference of 16.7% and 25.3 %, respectively. Our change map shows, for the first time, the entire spatial extent of the change. The slow down, extends hundreds of km upstream and onto the shelf. 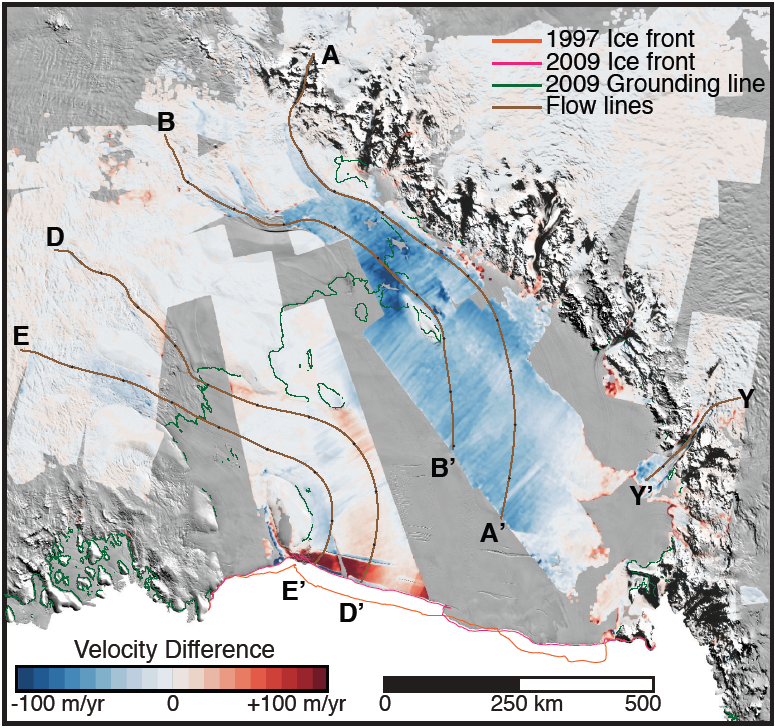 Regional variations in velocity changes on Ross Ice Shelf proper are defined by the ice streams and glaciers that constitute its catchment area. a strong impact on the mass budget of the Antarctic continent. Fig. 3. (comprising 5 graphs and 1 map above) Velocity Difference map (2009–1997) detail, 1997 and 2009 ice front, and flow line plots for Ross Ice Shelf overlaid on MOA. Each flow line includes markers every 100 km for easier orientation. The flow line graphs show the absolute velocities for 1997 and 2009 and the velocity difference. The vertical dashed line is the 2009 grounding line. h/t to WUWT reader “HR”. The expansion of the polar air masses whilst the sun reduced its activity levels after the peak of cycle 23 resulted in a relaxation of the westerly air flow around Antarctica which had previously been skimming ice away from the edges especially on the Antarctic Peninsula which projects out into those winds. 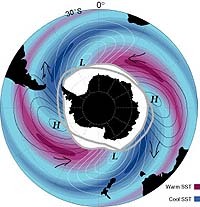 Zonal jetstreams show an enhanced and tighter such air flow around Antarctica and zonal jets are associated with high levels of solar activity on multidecadal and centennial timescales. This report is further evidence that a climate regime change occurred around 2000 which was when I first noted that the poleward drift of the jets and the permanent climate zones had apparently ceased. Since 2000 the jets and climate zones have begun an equatorward drift and in due course the effect on ocean heat content will become incontrovertible (unless the sun perks up again). Call me stupid if you wish but isn’t the Ross Ice shelf already floating in the sea? If so, how will it raise sea level when it breaks away? New paper using any and everything proves CAGW is real! Having exhausted all other possible causes, Melbourne University researchers conclude that the dramatic increase in local temperatures over the past 60 years can only be human-caused. A team of over 30 paleoclimatologists has spent the past decade examining natural records of climate including recent geologically preserved sites along with written records (eg newspapers) and other data (corals, tree rings and Antarctic ice cores amongst many others) to construct a detailed view of climate changes in the Australasian region over the past 1000 years. A PDF of the paper published in the Journal of Climate is available here for a fee. The research will form the region’s submission to the 5th IPCC climate change assessment report chapter on past climate due to be published toward the end of 2014. UK Guardian & other MSM already jumping on this one. Strange that recent stuff in the MSM about high temperature and disappearing global ice doesn’t much mention Antarctica. Anyone else spotted just where Cryosphere expert (and blogger) Anthony Watt has got his wires crossed (again) on the reports of what’s going on in the Antarctic? Recently discovered Circumpolar temperature wave is a new factor to consider. Satellite altimetry and sea surface height analysis have recently revealed a previously unknown feature of the Antarctic Circumpolar Current, the Antarctic Circumpolar Wave. This wave propagates westward against the current but ultimately ends up traveling eastward, due to the massive size of the ACC, at a slower rate than the mean flow. The wave circles the earth every eight to nine years (White and Peterson, 1996). It has a long wavelength (wavenumber=2) resulting in two crests and two troughs at any given time. The crests and troughs are associated with massive patches or pools of warm water and cold water respectively. The areas can be thousands of kilometers long. The warm patches are 2 to 3°C warmer than the mean sea surface temperature (SST) and the cold patches are 2 to 3°C cooler than the mean SST (White and Peterson, 1996). Though it is not yet clear how these waves are triggered or maintained, they directly influence the temperature of the overlying atmosphere. While the Wave’s effects on climate are just beginning to be studied, the phase (warm pool vs. cold pool) correlates well with four to five year rainfall cycles found over areas of southern Australia and New Zealand (White and Cherry, 1998). Some scientists believe that the Antarctic Circumpolar Wave may be more important than El Niño in governing rainfall over these regions. 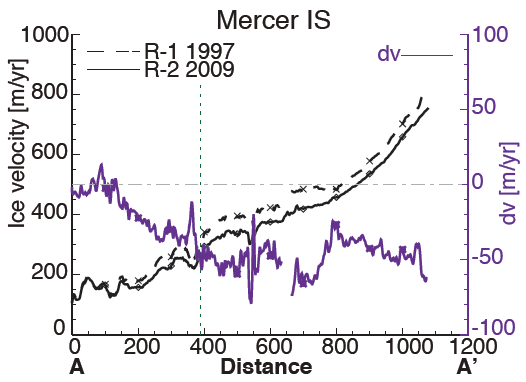 Also recently discovered high correlation between solar activity as expressed in the TSI reconstructions and the Antarctic’s MF bi-decadal variability, unlikely to be a coincidence, may eventually find its place in the Antarctic related literature. “The Antarctic is snoring…” — HA HA HA good one, Anthony. I therefore hope that global cooling is over by 2020 – if the curve shifts to the left. does anyone here perhaps have good (original) data from a weather station in Antarctica for me? It makes me cringe because sceptics have already explained ad nauseum why argumentum ad ignorantiam is taurus feces. The map showing the ice fronts doesn’t look like its oriented north-south. Here is a better map. There seems a north-south difference, with the 2 more northerly glaciers (D E) showing periods of acceleration, while the 2 more southerly ones (A B) show consistent deceleration. Other studies show Antarctic glaciers accelerate due to mass loss toward their terminus. So it looks like overall mass gain, with periods of mass loss for the more northerly glaciers,almost certainly due to increased insolation causing increased sublimation, since I don’t think it ever gets above zero here. When discussing the effects of the Antarctic ice melt, it is often overlooked that some part of Antarctic ice is floating ice and not continental ice, and further that the ice shelfs that are presently and/or most prone to calving are already floating and therefore will not add to sea level rise. This is not about science it is about scaring the “chicken littles” into jumping off a cliff. Antarctica is, and will likely remain, very stable from an Ice extent volume. 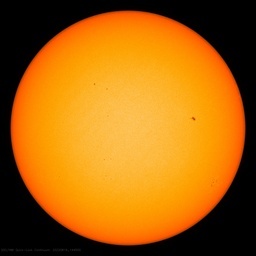 A gradual increase or leveling off of the ice is most likely going to continue for years to come regardless of what dire predictions we see coming out of the chicken little crowd. BTW did anybody notice the recent plummeting of the Arctic sea ice on the AMSR site? It is falling at a rate that is more indicative of late June or early July. Any explanations for this or do you think it is just an anomaly and will start to slow down in the decrease rate? Why is table 1 of the paper left out? In between there hasn’t been any measurements done by these satellites at all. The data collected by these two measurements (six months in total at the beginning and at the end of a 12 year period – 3 months in spring and 3 months in autumn) were used for this paper. 1 How would the skeptical world react if these measurements did show a speeding up of the icesheet knowing the above data? What can we really conclude by these measurements? This goes in the Global Conditions Not Global file. The more of these things you see, the more you (should) wonder what “global” averages or trends means. And it has always been this way. Look to any temperature, precipitation or glacial change studies around the world, and you’ll find multi-decadal differences in timing by region. Changes migrate across the world, but not to all areas all the time. 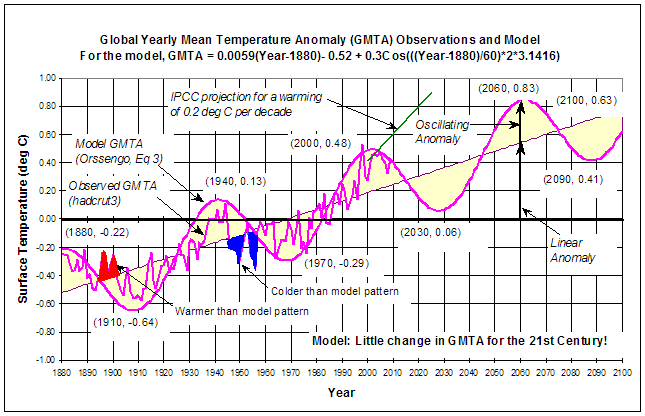 The MWP controversy – global or regional – should have worried the warmists, as it suggests that the current warming might have been viewed the same way as the MWP if the events were reversed, i.e. the MWP were happening today, and Gore-Warming were happening in the medieval times. Without the Arctic warming data of Hansen, GISTemp becomes HadCru. HadCru makes CAGW questionable, at least on the basis of the last 15 years. If other subregions were excluded, would we have global warming at all? It is disingenuous to say that global warming proceeds regionally – unless you add “at first”. And then you have to define the time period. But it must proceed globally, even to a proportionately smaller scale, by some point. Yes, the global maps of temperature anomalies show a general reddening. But to CAGW-required levels? First the Himalayas and now Antarctica. What is the world coming to? Warmists must understand that climate change doesn’t just go in one direction. eehhh, well, we knew that it was cooling…. Do you perhaps know where trhe original data are? HadCru makes CAGW questionable, at least on the basis of the last 15 years. did you have look at my results, yet? CT is at it again.. compare their ice area extent with norsex. mention it but I”ve not seen a link. The polar regions are extruding. God forbid the extrusion rate ever exceeds the loss rate. So it appears a fully paid up believer in the IPCC’s science is willing to publish inconvenient work. Seems like a health state of affairs. Hopefully this will rein in the antarctic alarmists. Just got to work on the Himalaya glacier alarmists and hurricane alarmists and sea level alarmists and extinction alarmists and acidic ocean alarmists. Did I leave any out? The disreperancy between Norsex and CT would probably be even more glaring if the baseline average period was the same on both charts, Norsex is using montly averages for 1979 to 2006 ( 28 years ) , while CT claims to be using the 30 year average 1979-2008 baseline . Just eyballing The norsex chart 2007 and 2008 seem to both to have been somewhere in the -500000 to -1 million square Km below their 28 year average for most of this this period of the year, so the montlhy averages for april and may might be some 20-30 thound squre kloms lover if the went to the full 30 year average. Snark is a snide remark, generally sarcastic, malicious, and used to attack. In other words, Snark is the language of the AGW true-believer. Kinda like Klingon. Thankfully, the glaciers in the region that they studied near the Ross Ice Shelf seems to be ok. Makes sense to me, since the area looks like a wedge, but that’s just me speculating. Hopefully, as temperatures very likely increase in the future, the Ross can maintain. The conclusions section of the paper does indicate that the area they studied is in contrast with the areas bordering the Amundsen and Bellingshausen seas (West Antarctica and the Antarctic Peninsula), where the most changes are taking place. The Pine Island and Thwaites glaciers, as well as the many glaciers on the peninsula are the potential risks. Good thing we have scientists keeping an eye on the region. “Snark” sounds like a mash-up of SNide & sARCastic. Whereas the warmistas find this sad (for reasons other than the good of Humanity), I find this ominous. SteveSadlov says: ……… I find this ominous. Why? You long on fast moving glaciers? How exactly can slow moving glaciers in the antarctic be ominous? I can see these two satellites coming to a sticky end if they don’t start giving the results that they should. Or they could end up like ENVISAT declared dead in space. otter17~ considering the temperature trend the last 50 years (highest temp ever recorded, -12C on December 25th, 2011 (High summer)), how long do you figure it will take for temperatures to climb high enough to have an effect? how long do you figure it will take for temperatures to climb high enough to have an effect? I’m not qualified to make a guess there since I’m not a scientist, but the data shows the Pine Island, Thwaites, and most of the Antarctic peninsula glaciers have sped up. At what steady-state speed they will end up at is probably a very difficult question to figure out. All we know is that they are budged from their previous mode of operation since there is a mass imbalance now. I’m just thankful the Ross shelf is doing its job, where other ice shelves have failed. It is good we have at least a handful of glaciers that are in mass balance, or slightly positive. In other words, otter17, quite a bit longer than your people keep telling the public. Centuries at the very least. It is presumptuous to make that leap based on my look at the situation, and I don’t know what specific projections you mean “my people” have given to the public. Several peer reviewed papers indicate sea level rise projections based on the authors’ expert opinions on the dynamics of ice sheets, glaciers, etc. Paleo records on sea level indicate that there have been periods of natural warming and fairly rapid sea level rise, such as during interglacial periods (about a meter per century on average, though more rapid jumps in sea level observed). Furthermore, paleo records have shed some light on previous eras where the Arctic ice sheets have collapsed. So, the Earth has had its sea level rise on the order of meters per century in the past, indicating that today’s rapid forcing on climate may be able to create a situation where it can rise just as fast, or maybe faster. So, while the Ross embayment area is ok for now, paleo records indicate that in the past it has been open (second link). Yet the whole point of this article is the scientific PROOF that the things your people keep saying will happen, ARE NOT HAPPENING now. My computer screen has about 16 million colors (so they claim). Some of their color claims are actually luminance or luminous emittance changes rather than color changes. I do believe there possibly may be 4,096 different colors, but I can’t vouch for any more. (put two pixels side by side to see if they are different colors). So wouldn’t you think that the authors of that map of Ross ice shelf ice movements could find four different colors to show what ever it is they are trying to show, instead of four similar colors ?